I first came across Ronin brand gis last year after reading Aesopian’s review of their Fighter model gi (currently on sale for ~$80). After a few emails with Doug at Ronin I was able to get my hands on their newest model, the Samurai. 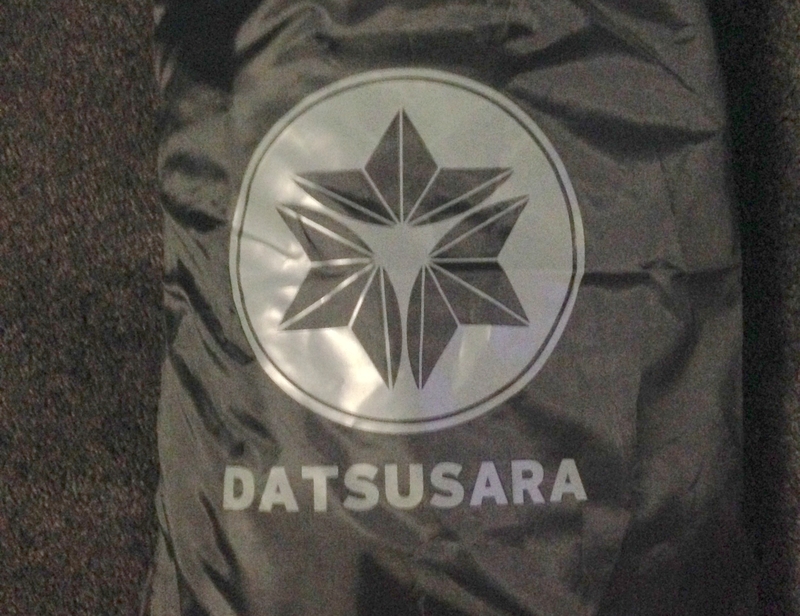 The Samurai is available in white, blue and black. The gi is available in the traditional sizes (A1 thru A5) as well as long (A1L thru A3L) and is priced at $139.95 (white) or $159.95 (black & blue) (which includes free US Shipping). The Samurai gi consists of a 450g pearl weave jacket and 11oz duck canvas (which is actually a form of linen) pants. We’ve all seen plenty of pearl weave jackets. They’re lightweight, durable and resist stretching. The collar is EVA foam filled and is thick & sturdy. However, duck canvas is something new to me. Duck has a long history as worker’s clothing, sails, tents and even the original duck (aka duct) tape. Some of its purported advantages include a relatively smooth surface that isn’t prone to snagging or tearing, softens as it’s worn/washed and is resistant to wind/fire. I doubt I’ll ever be testing the last two but it’s nice that it’s there just in case J For more information than you could possibly ever need on duck canvas check out this article from Sierra Trading Post. Of the pants that I’ve worn these are most similar to the bull denim pants of the Diaz Bros gi from Lucky Gi. 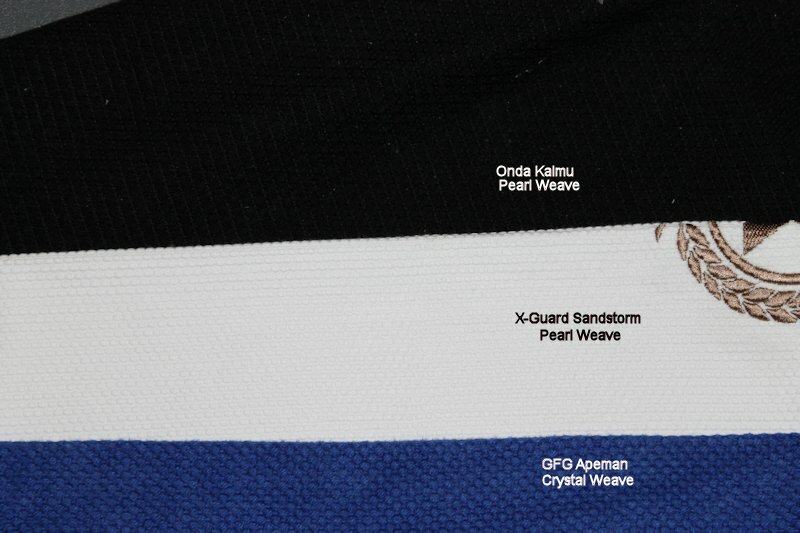 The jacket is lightweight, 450g pearl weave, and preshrunk. The navy blue gi has white stitching for contrast and the seams are consistently well-done and even. There is extra reinforcement at the armpits and the skirt slits as well as reinforced stitching at stress points. The inside of the cuffs are lined with cotton tape for extra comfort and the skirt slits are trimmed in white as a design element. My overall impression of the construction of the gi is positive and the gi looks to be one that will stand up well over time. There is embroidery on the upper shoulders that consists of Ronin’s traditional feather and chrysanthemum logo. It is 3” diameter and the word “Ronin” is embroidered underneath. “Ronin” is also embroidered on along the left lapel in the same “blood script” as the shoulder logos, the lettering is approximately 9” x 3”. Finally, “Ronin” and the Japanese kanji for Samurai Jiu Jitsu has been embroidered at the base of the skirt on the back. This embroidery is approximately 11” x 4”. The design was created exclusively for Ronin by everyone’s favorite BJJ artist, Seymour Yang (aka Meerkatsu). The pants are constructed of duck canvas as mentioned above. There are six belt loops and a cord drawstring to keep them in place. The side slits have some extra stitching and fabric for reinforcement. The stitching and seams use white thread for contrast and have been reinforced at the stress points. The stitching is consistently well-done and even. The knee reinforcement starts at mid-thigh and continues down seven inches from the cuff. There is a Ronin Brand patch on the right upper thigh that has the company log with some kanji on it. The patch is 1.875” x 3.5” and would be easily removed with a stitch ripper. The only of other adornment on the patches is a piece of embroidery on the lower left leg. While rolling the gi had good length in the arms and torso but was a little baggy for me. The same can be said for the pants. I’m currently rolling at 190lb and am sure that if/when I move up to heavy this gi will fit me better. I don’t feel that the cut affected its performance on the mats. The artwork on the inside of the gi began to peel some after a few washes (gentle cycle and hung dry) and as it began to peel there was some itchiness. I usually wear a rashguard so this didn’t bother me too much. 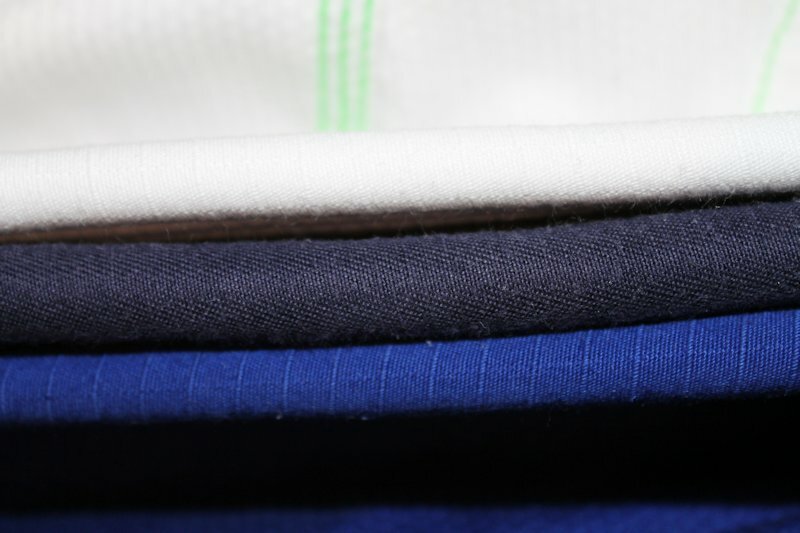 The other notable feature of the gi is the collar. The Samurai has one of the thickest and stiffest collars that I’ve ever rolled in. Probably on par with the X-Guard Sandstorm and Newaza Nation gi. I’d also point out that they gi did NOT shrink after washing in cold and hanging drying. Most pre-shrunk gis still shrink some but this one didn’t so if you get one don’t expect it to shrink down a size or two. A quick word about sizing. I have a lot of people ask me what size gi they are and my answer is always, “That depends on the brand.” I personally, have A2Ls, A3s, A3Ls and A4s that all fit me. My instructor wears A2, A3 and in one case an A4. It really is important to do research and contact the company before investing your money in a gi. That said, the Ronin size chart is accurate and will give you a very good idea of how the gi will fit. The only thing I’d add to that is that in their case the “L” means long and that’s not exactly the same slim. Ronin and Seymour did a very nice job on the overall aesthetic of the gi and have still left you with plenty of room for school or sponsor patches. It’s also worth mentioning that Ronin has brought a new fabric, duck canvas, for use in their pants which should increase their durability and lifespan. The gi is priced at $139.95 (white) or $159.95 (black & blue) (which includes free US Shipping). This price is competitive with other gis (especially the white gi) and the inclusion of shipping is always a nice bonus. The Samurai is constructed well, should last a long time and would be a good option for anyone with a muscular build especially if you’re a big Meerkatsu fan (and aren’t we all). If you’re looking for a review of Ronin’s Gold Class and Insignia gis, check out Meerkatsu’s review here and for another review of the Samurai go here.